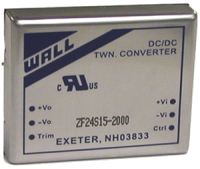 The ZFW series of high efficiency dc/dc converters provide up to 30 watts of output power. This series has single and dual output models available. These converters are ideal for telecom and networking applications. The ZFW series is designed for a 4:1 input range, either nominal 24VDC (10VDC-40VDC), or nominal 48VDC (18VDC-75VDC). These units are also PCB mountable, with a package size of 2″ x 1.6″ x 0.4″. Standard specifications include L-C type input filter, external trim of ±10%, excellent load regulation, and short-circuit protection. The isolation voltage meets standard telecom requirements of >1600VDC. Special electrical screening (“ES” suffix) is also available please call factory for more details. Notes: (1) Typical value at nominal input voltage and full load. (2) Typical value at nominal input voltage and no load. (4) Test by minimum Vin and constant resistive load. (5) ON/OFF control function: The pin voltage is referenced to negative input. To order negative logic ON/OFF control add the suffix “R”. (6) The ZFW series can meet EN55022 Class A with an external capacitor in parallel with the input pins. 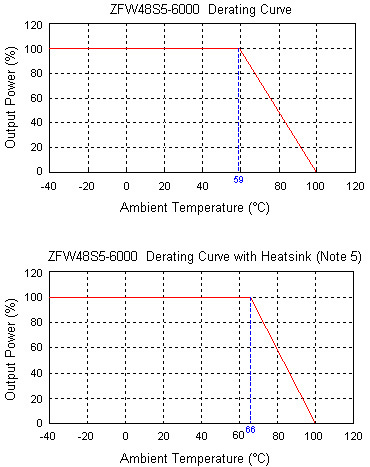 (7) Heatsink is optional. Please call factory for ordering details. 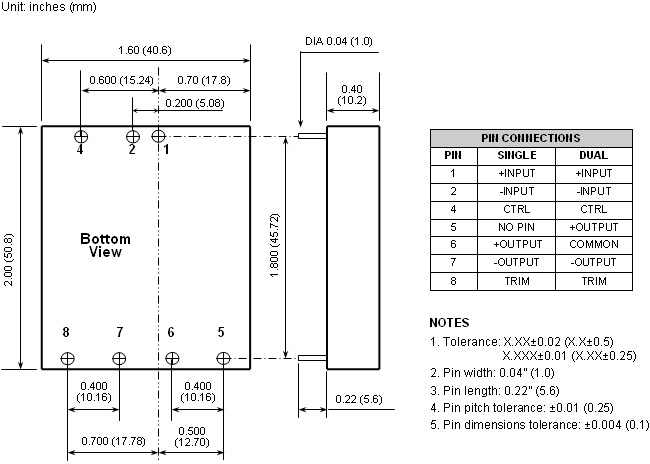 (8) An external input filter capacitor is required if the module has to meet EN61000-4-4, EN61000-4-5. Suggested filter capacitor: Nippon chemi-con KY series, 220µF/100V, ESR 48mΩ. (9) Option to have case connected to -Vout pin for improved shielding, add the suffix “-C” to the part number and consult factory. (10) For special electrical screening add the suffix “ES” to the part number (see Appendix I on the bottom of page 5). Please call factory for more details.